Forget the press conferences. Forget the Twitter rows. Forget the name calling, the abuse, and the bottle throwing. 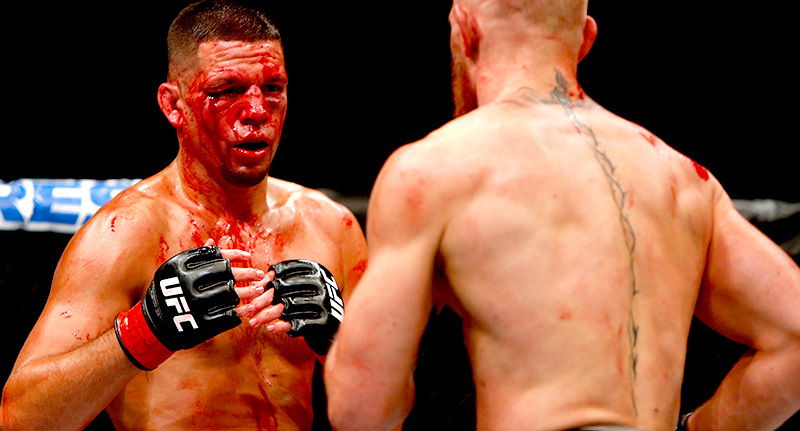 Both Conor McGregor and Nate Diaz are true sportsmen. And if you ever needed any proof of this, all you have to do is scroll on down and watch the video. I’m sure you’re all aware by now that in the early hours of this morning Conor McGregor was able to defeat Nate Diaz and evoke revenge for his shock loss back in March, reports the Irish Independent. The fight was a bloody one. As soon as it all began McGregor went straight at it and bust up the face of Diaz pretty badly, knocking him to the canvas numerous times. However instead of taking the fight to the ground, McGregor forced Diaz to get back on the his feet to a place where the Irishman felt more comfortable. Despite absorbing every shot McGregor could throw, Diaz only really turned it on towards the end of the second round – but by then, it may have been too late. The UFC 202 war came to a dramatic close as Diaz finally pinned McGregor to the floor and began to open up with a tirade of punches to the unguarded face of McGregor but just seconds before Diaz had chance to win, the bell rang. Instead of walking off to his team, or cheering to his fans, Diaz helped McGregor back to his feet and the two embraced one another in a sweaty and bloody hug. Perhaps I’m being romantically exagerative here but to me the pair resembled two rival warriors, gladiators or so, who – at the end of the day – utterly respect one another’s efforts and strength. In the immediate aftermath of the embrace, McGregor was crowned ‘King’ after winning by a majority decision of 48-47. Draped in the Irish Tricolour, McGregor stopped and gave Diaz another quick embrace once the decision was announced. But soon enough we should be set for round three of the McGregor Diaz showdown. I wonder who’ll be the real King of the trilogy?